This web part replicates the classic Promoted Links Web Part but with added features such as web part properties to change the background colour, size of background image and to select which promoted link list to use. You can download it here. 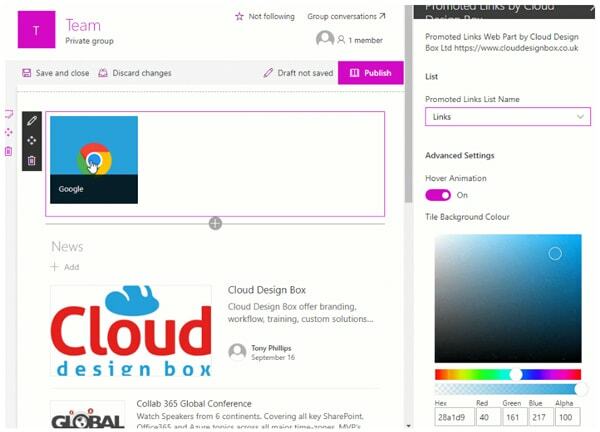 For more information on the full Cloud Design Box learning platform for modern SharePoint or custom workflows and design, Contact us via the website. You can find the complete source code in my GitHub repository at https://github.com/CloudDesignBox/cdb-promoted-links. As soon as I get chance, I will create some additional blog posts on how this web part was created, breaking down the different task lists. While I work on that, please feel free to download the code and have a play yourselves!